We knew it….the Underground is a Woman! SallyB2 We knew it….the Underground is a Woman! After masquerading as functional, rational, squared-off and decidedly masculine entity for over a century, the London Underground has this week come out as a woman. A new, sweeping, curvaceous tube map has come to light: it rather resembles a multi-coloured Medusa, or perhaps a mad conductor…but be careful what you see in it as the creator, Max Roberts, is in fact a psychologist. 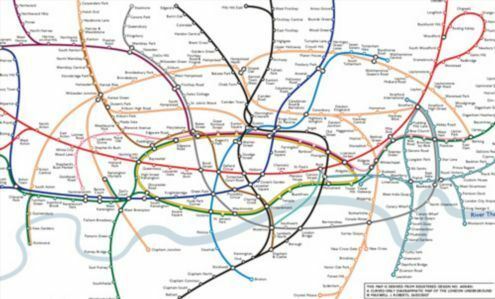 The original map by Harry Beck is of course a work of topological genius, and has become an icon in its own right (although Londonist finds the LU thong frankly rather scary). But it offers very little resemblance to the journey and direction which you actually want to take. Roberts’ new map goes some way towards correcting that – lines go in the right direction, and you don’t get that feeling of momentary panic that you’re on the wrong train ‘cos you’re apparently travelling north to go south. What do you think? And how do we get TfL to take it on? Image from flickr courtesy of the inimitable Annie Mole.